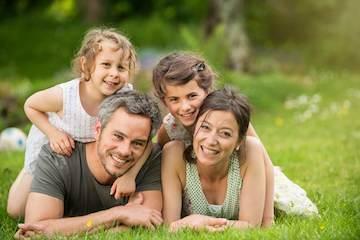 Does your family have a caring, skillful dental team? At Maine Family Dental practice, we’re here for you! Whether you’re concerned about an ailment, you desire cosmetic improvements to your smile, or it’s time for a dental check-up, we have everything you need right here at our convenient Bangor location. Our team members pride themselves on being skilled in the latest technologies in the field of dentistry. At Maine Family Dental, our team is friendly, knowledgeable, and driven to provide you with the best possible care. We are pleased to serve dental patients in Bangor, Winterport, Orono, Brewer, Orrington, Holden, and adjacent communities. If you would like to schedule a dental appointment, please call us at (207) 947-1166. Dr. Travis Buxton and our team will make sure you feel at home at our dental office, located in Bangor’s stately Crosby House. Do you treat patients of all ages? What dental services do you offer? How often do I need dental exams and cleanings? What do I need to know about my first dental visit? What do recent changes in insurance policy mean for my dental coverage? Yes, we are always happy to welcome new members into our dental family from all around the Bangor including our neighbors from Winterport, Orono, Brewer, Orrington, Holden, and adjacent communities. We know that each member of your family needs special care depending on what stage of life they're in. For instance, a child requires different services and attention than a family member in his or her elder years. At Maine Family Dental, we offer the right care for every family member as he or she progresses through each stage of life. Our skilled dentist is knowledgeable when it comes to treatment for all ages. If you have questions or would like to schedule a dental appointment, please call our Bangor, ME dental office at (207) 947-1166. We offer dental treatment for everyone in your family – from young children to grandma and grandpa. Your oral health needs change throughout your life, and we provide age-appropriate treatment to meet those ever-changing needs. Whether your little one is ready for their first appointment or you’re a senior who requires teeth repairs, we provide all the high-quality services and personalized dentistry your family needs. Please call our Bangor dental office at (207) 947-1166 to arrange a dental exam to learn how we can use these services to help you achieve your oral health goals. Are you interested in improving the appearance of your smile? At Maine Family Dental, we offer the latest in cosmetic dentistry. A great-looking smile can boost your confidence, improve your self-esteem, and help you feel great about your appearance! Tell us what your goals are, and we’ll be happy to recommend the best ways for you to achieve your perfect smile. We’ll work with you to develop a comprehensive cosmetic treatment plan. For most adults, we encourage appointments at our Bangor dental office every six months so that we can thoroughly examine your mouth for any potential problems. If you are over age 30, one of our main concerns is the prevention and treatment of periodontal disease. This is important to us because of the prevalence of gum disease and the potentially severe health consequences associated with it. If our dental team finds evidence of gum disease, we will provide appropriate gum treatments that may require more frequent teeth cleanings to control. Children can be brought in for a visit as soon as their baby teeth start to come in. Our gentle team looks forward to getting to know little ones and helping them feel comfortable in the dentist’s chair. We enjoy educating children about good dental health, and we provide services like teeth cleaning and early orthodontic treatments. We also offer “no shot” laser dentistry options, which are particularly useful in treating children. For your first visit, we recommend that you come equipped with information about your medical history. You can find the forms you need on our forms page. You may also want to bring a list of medications that you are taking, and be prepared to answer questions about your health. Knowledge about your medical history can help us understand how to treat your body with overall wellness as our ultimate goal. After being cared for by our gentle, thorough dentists, you'll want to become a patient for life - and we wouldn't have it any other way! Schedule your new patient consultation today by giving us a call at our Bangor dental office at 1-207-947-1166. At Maine Family Dental Practice, our priority is providing you with the care and treatment that you need - from routine teeth cleaning services to restorative treatment. Accordingly, we offer a variety of payment options. You can pay using cash or any major credit card including MasterCard, Visa, American Express, and Discover. For your convenience, we also accept CareCredit. We work with almost every type of dental insurance at our Bangor dental office and are a preferred provider for Northeast Delta Dental. This allows us the ability to provide you with the care you deserve without being held back by the dictates of insurance companies. If you are not sure whether or not we accept your insurance, don't hesitate to ask! Together, we will determine the best way for you to get the treatment you need - while fitting payments into your lifestyle and budget. If you have any questions about your insurance or how to finance your dental work, don't hesitate to contact our dental office and we will be glad to help! According to projections provided by the American Dental Association, the Affordable Care Act may result in an additional 8.7 million children gaining extensive dental coverage. About 17.7 million adults could gain some type of dental coverage. Residents of Maine have been allowed to purchase health insurance plans through an online "exchange" since October 2013. The Affordable Care Act has changed the standards of acceptable dental offerings for each of these plans. For more information on how the changes in health care legislation affect your life, you may want to visit the Maine Public Broadcasting website at mpbn.net and also the American Dental Association's section regarding the Affordable Care Act at http://www.ada.org/news/8935.aspx. If you have any questions about your specific plan, contact our Bangor dental office, and we will go over your benefits with you! Get started today by calling (207) 947-1166 to schedule your dental exam with Dr. Travis Buxton. We can't wait to meet you! Maine Family Dental is conveniently located on Stillwater Avenue in Penn Plaza across from Goodwill. Our hours are 8 am to 5 pm Monday through Thursday. We’re happy to discuss dental financing options with you. We accept cash and major credit cards. We also work with CareCredit and most insurance providers. Ask about our interest-free financing! "I have been a patient of Dr. McGarr's for many years. One of his very nervous patients, I might add. He and his staff always try to make me feel ..."